Mega Sale! Free Shipping Included! 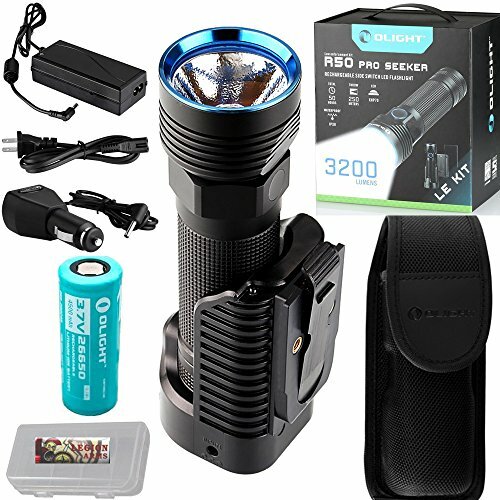 Save 21% on the LE Kit: Olight R50 PRO Seeker LE, Law Enforcement Kit, 3200 Lumens Military Grade Police Tactical Rechargeable LED Flashlight Searchlight with 26650 Battery, Holster, Charging Dock and LegionArms case by Olight R50 Pro Seeker LE at SFCPA. MPN: Olight R50 Pro Seeker LE. Hurry! Limited time offer. Offer valid only while supplies last. The R50 PRO LE (Law Enforcement) is a high-output, rechargeable side-switch LED flashlight that utilizes Olights signature magnetic charging system. The R50 PRO LE (Law Enforcement) is a high-output, rechargeable side-switch LED flashlight that utilizes Olights signature magnetic charging system. Size: Length: 128 x 32 mm | Body Diameter: 5.04 in. x 1.26 in. 3200 Lumens max output Utilizes Cree XHP70 cool white LED with a life span of 50, 000 hours. If you have any questions about this product by Olight R50 Pro Seeker LE, contact us by completing and submitting the form below. If you are looking for a specif part number, please include it with your message.